RUSSIA INTERNATIONALS ALESKANDR Kokorin and Pavel Mamaev have turned themselves in to police following an incident in Moscow on Sunday. 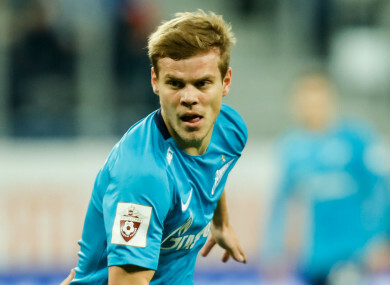 Zenit striker Kokorin ran the risk of being put on a federal wanted list unless he reported to authorities prior to a police-set deadline after the 27-year-old was filmed on a CCTV camera attacking a man with a chair in a cafe. The man who was struck was named in the Russian media as Denis Pak, an official from the Ministry of Industry and Trade. Sergey Gaysin, the CEO of the State Research Centre of the Russian Federation, was allegedly also attacked. Mamaev of Krasnodar, who faced Zenit in a league match on the day of the incident, was also said to have been involved in the clash, with the 30-year-old turning himself in. Kokorin failed to turn up before the requested time but did eventually report to police to answer questions after Russia’s interior ministry opened an investigation, with both players expected to be detained for 48 hours. “The second participant in the conflicts, Aleksandr Kokorin, appeared at the main investigative directorate of the Ministry of Internal Affairs of Russia for the city of Moscow to conduct investigative actions,” said Irina Volk, the ministry’s official representative. Zenit released a statement on Tuesday to announce they are considering what punishment will take against Kokorin, who missed the 2018 World Cup on home soil due to injury. Krasnodar, meanwhile, confirmed they are exploring the possibility of terminating Mamaev’s deal. Should they be dismissed by their respective clubs, the duo could be barred from playing in the Russian Premier League if a breach of contract is established, according to the competition’s president, Sergey Pryadkin. Ahmad Aidamirov, general director of top-flight club Akhmat Grozny, has backed such a move. He is quoted as saying by Sport-Express: “There are certain agreements and mutual understandings between the [Russian] Premier League clubs. Shamil Gazizov, general director at Ufa, is in agreement, adding: “In my opinion, for moral and ethical reasons, we have no right to do that [sign the players if they are sacked]. Email “Russian football stars turn themselves in to police after cafe clash”. Feedback on “Russian football stars turn themselves in to police after cafe clash”.